Christopher Howard is a critic, editor, and curator based in Astoria, New York. His first book, The Jean Freeman Gallery Does Not Exist, was published by MIT Press in September 2018. Howard’s writing has been published by Artforum, Modern Painters, Art Papers, the L Magazine, the Brooklyn Rail, Burnaway, the International Review of African American Art, the Art Book, ‘Sup, and the Orlando Weekly, among others. Howard has edited essays for exhibition catalogues published by the Museum of Modern Art of Fort Worth and the Museum at FIT and served as a proofreader for the magazine Art on Paper. Since 2006 he has organized several critically praised solo and group exhibitions in Brooklyn and Manhattan. In 2011 he founded In Terms Of, a single-authored blog that publishes criticism on lectures, panels, symposia, conversations, and other live speaking engagements. In Terms Of received a 2014 award from the Arts Writers Grant Program, sponsored by Creative Capital and the Andy Warhol Foundation for the Visual Art. An examination of a 1970s Conceptual art project—advertisements for fictional shows by fictional artists in a fictional gallery—that hoodwinked the New York art world. 2015 Marica Vilcek Curatorial Fellowship, awarded by the Foundation for a Civil Society, New York. 2015 participant in the Luminary Residency Program, Saint Louis, Missouri. 2014 award from the Arts Writers Grant Program, sponsored by Creative Capital and the Andy Warhol Foundation for the Visual Art. 2013 participant in the Art & Law Program, New York. Jennie Waldow, “Christopher Howard’s The Jean Freeman Gallery Does Not Exist,” Brooklyn Rail (December 2018–January 2019). Domenick Ammirati, “Jeaneology of Morals,” Artforum, December 3, 2018. Editors, “From the Archives: Ripping Off the Art Magazines,” Art in America, November 14, 2018. Lucy Watson, “The Jean Freeman Gallery Does Not Exist,” ArtReview 70, no. 7 (October 2018). Editors of ARTnews, “From the Archives: A Fictional Writer Profiles a Fictional Artist, in 1969,” ARTnews, October 5, 2018. Andrew Russeth, “The Gallery That Wasn’t There,” ARTnews, October 4, 2018. Dushko Petrovich, “An Email Interview Concerning a Website about Spoken Events,” Art Practical 6.4 (May 27, 2015). Lee Rosenbaum, “The End of Art History: Getty Abandons Preeminent Research Database,” Culturegrrl, March 26, 2010. 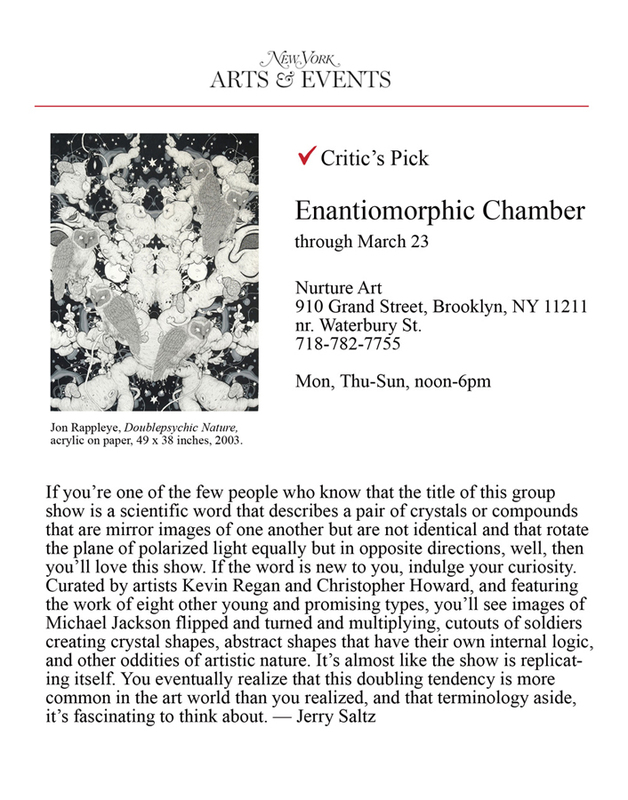 Cassandra Neyenesch, “Artseen: Enantiomorphic Chamber,” Brooklyn Rail (April 2008): 38. Jerry Saltz, “Critic’s Pick,” New York, March 9, 2008. Deborah Garwood, “Video Beginnings,” PAJ: A Journal of Performance and Art 84, vol. 28, no. 3 (September 2006): 39–47. 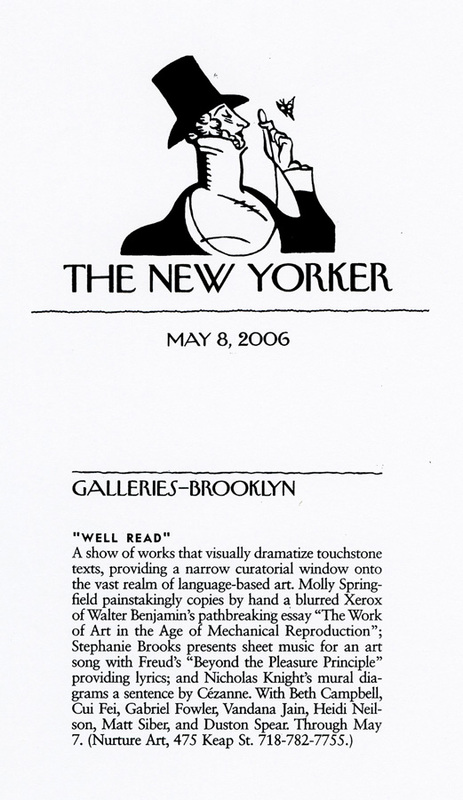 Frances Richard, “Goings On about Town: Galleries–Brooklyn,” New Yorker, May 8, 2006, 14. Holland Cotter, “Art in Review,” New York Times, April 28, 2006, E37. Shane McAdams, “Artseen: Well Read,“ Brooklyn Rail, April 2006, 26.